NOV 6: For the Zara Moto Biker Jeans we offer the BP Washed Moto Leggings ($39) as shown at Nordstrom. 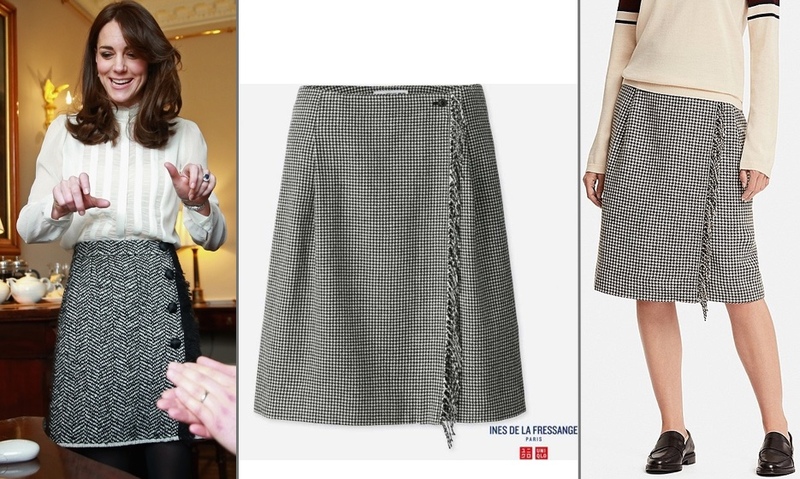 SEP 8: For Kate’s Dolce and Gabbana skirt first seen in February 2016, this is the Wrap Fringe Skirt ($49.90), part of Uniqlo’s Ines de La Fressange collection. 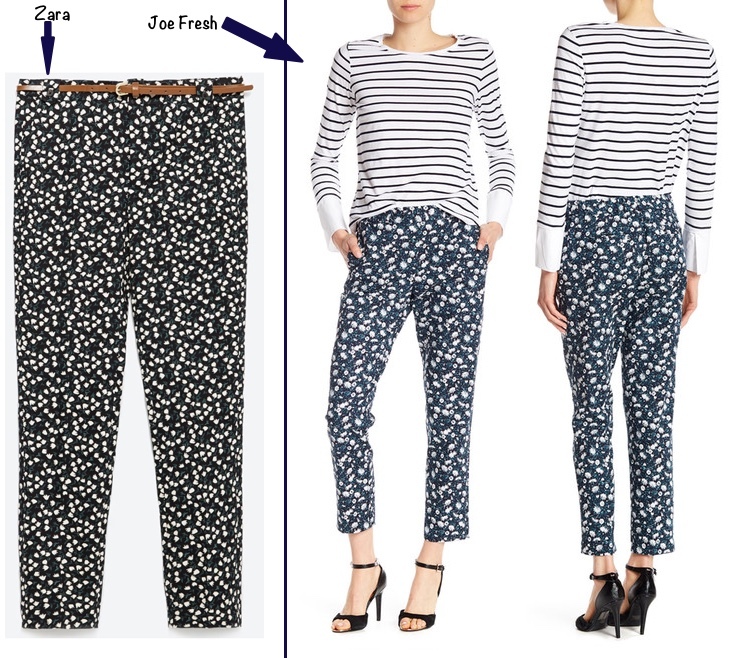 MAR 29: For Kate’s Zara floral trousers worn to the Rugby World Cup match in 2015 we offer the Joe Fresh Floral Print Trousers ($27.97 at Nordstrom Rack); they are also available at Joe Fresh ($19.46, much less than at Nordstrom Rack.) Another great tip from Janet E on the Facebook page! 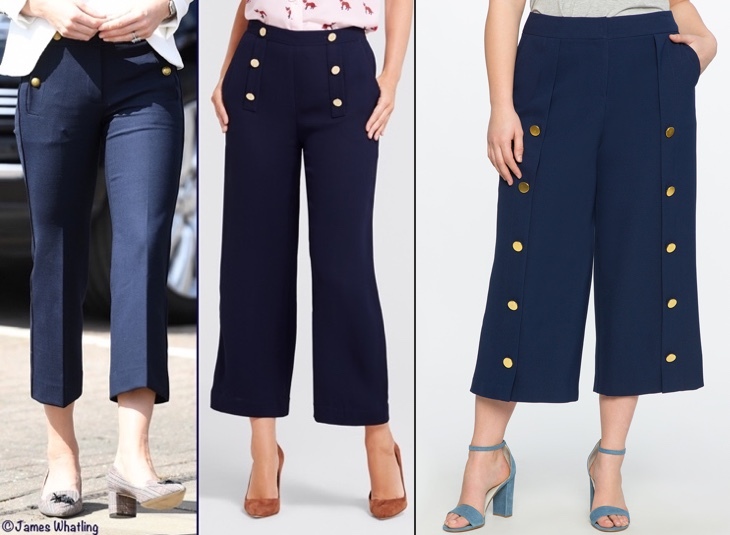 MAR 5: We have two repliKates for the Monreal Tuxedo Track Pants: second from the left we show Topshop’s Popper Track Pants ($68); on the far right, the Topshop Side Stripe Jogger Pants ($40). Both styles are shown at Nordstrom; I was able to find the Jogger Style at Topshop (also $40), but not the Popper style. A shoutout to Janet on the Facebook page for the fab tip! FEB 12: The fab Sailor Cropped Pant is 50% off ($125) at Draper James. While not an identical look, we also show the Eloquii Wide Leg Button Culottes ($44.99). Thank you to Kat H. on the Facebook page for the tip on the Draper James trousers! 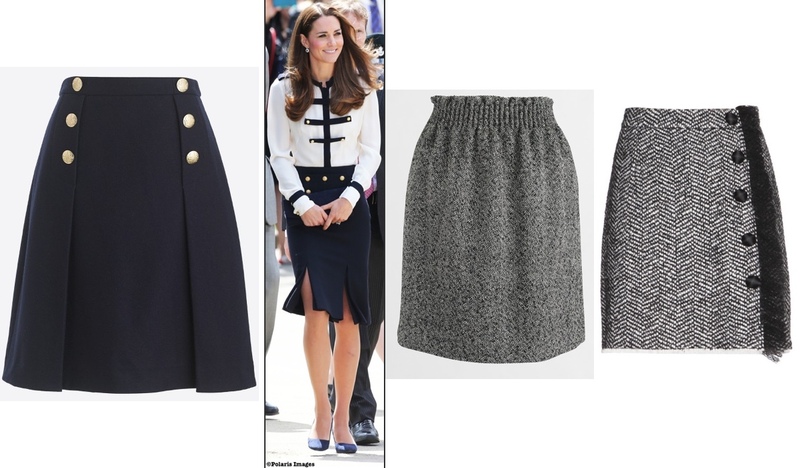 NOV 9: We have a couple of skirt repliKates to share: for the military look skirt by Alexander McQueen, we offer the Mini Skirt in Double-Serge Wool ($51) from J Crew Factory. On the right, the Herringbone Mini Skirt ($64.50), also from J Crew Factory. A big ‘thank you’ to the ever-fashionable Audrey for both tips! SEP 7: For the Dolce & Gabbana tweed skirt, this is from Talbots, the Check Tweed Wrap skirt in Misses sizes($109) and in Woman sizes ($129). Another terrific tip from Janet E on the FB page! MAY 3: For the Zara Mid-Rise Biker Trouser, this is the H&M Biker Trouser (£19.99, about $25). Our thanks to Sophie Flowers/Gloucestershire Live for the H&M tip. 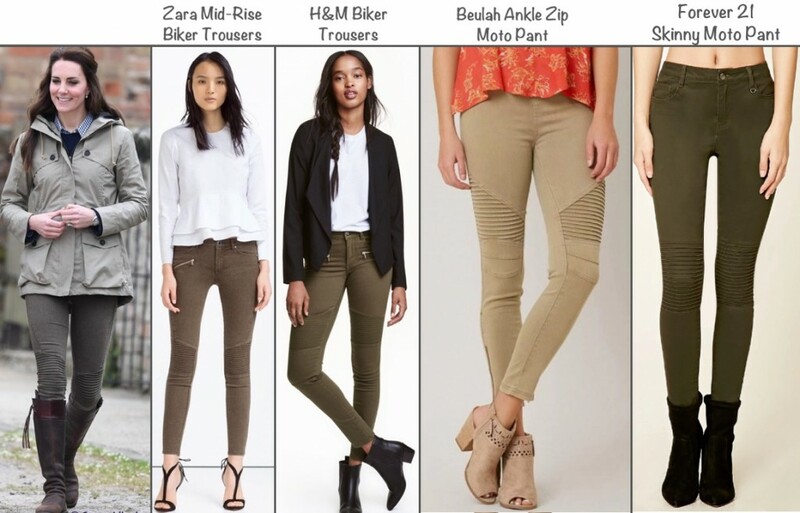 On the right, the Beulah Moto-Stretch Legging in both beige (shown), as well as olive, $52.49 at Overstock.com; the Beulah style is also available at Amazon, where it is called the Beulah Ankle-Zip Moto Pant ($50.75); on the far right we show the Skinny Moto Pants, $15.99 at Forever 21. 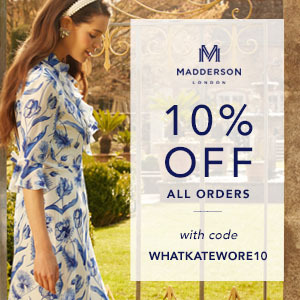 MAR 29: For the McQueen military style skirt, this is LK Bennett’s Bay Button Skirt (£145 with free US delivery) as shown at House of Fraser. FEB 24: For the Paule Ka skirt suit, we offer some skirt options: the Ponte Knit Skater Skirt ($16.99) at Charlotte Russe; the Lavand Knit Skater Skirt in burgundy ($46) at ASOS. 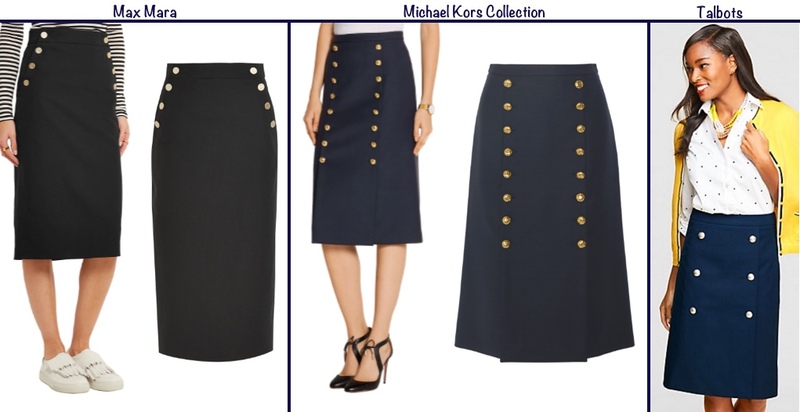 JAN 23: For the McQueen military style skirt we offer: the Max Mara Cotton Linen Blend Stretch Skirt ($243) Michael Kors Collection Button Detail Wool Blend skirt (this one is expensive, $495); the Faux Wrap Aline Skirt ($99) from Talbots. 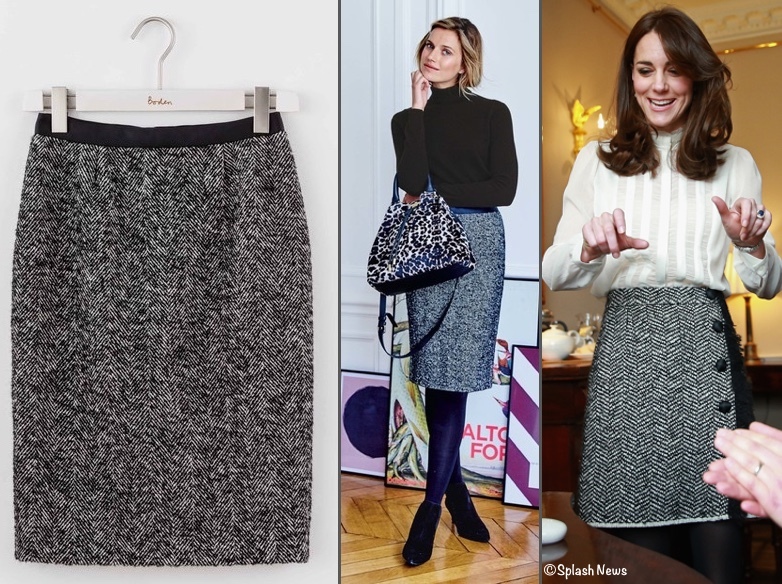 NOV 8: For the Dolce and Gabbana skirt this is the Freya Pencil Skirt ($138) from British-based retailer Boden. AUG 12: For the Alexander McQueen broderie anglaise skirt, we show the Diamond Eyelet Skirt from Ann Taylor ($39.88) in the center; on the right, the DVF Sadey skirt ($79.80). APR 26: With thanks to a reader named Maddie for the tip, these Old Navy Pixie Jeans are a great stand-in for the Zara coral jeans worn to the Olympic Park in 2012. The color we show is ‘Mango Magic,” the jeans are $22.97. 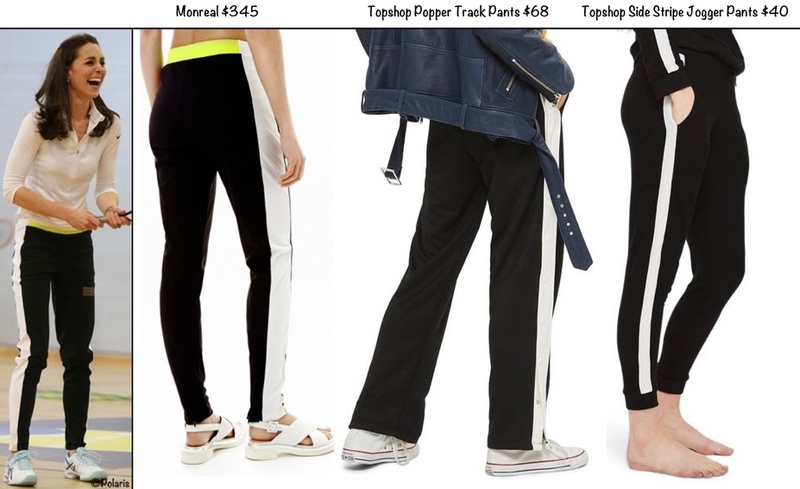 MAR 13: For the Monreal London Track Pants worn in Edinburgh Feb 24th, this is the Side Stripe Legging by Woman Within. Our thanks to Patty M for the tip on these on the WKW Facebook page! 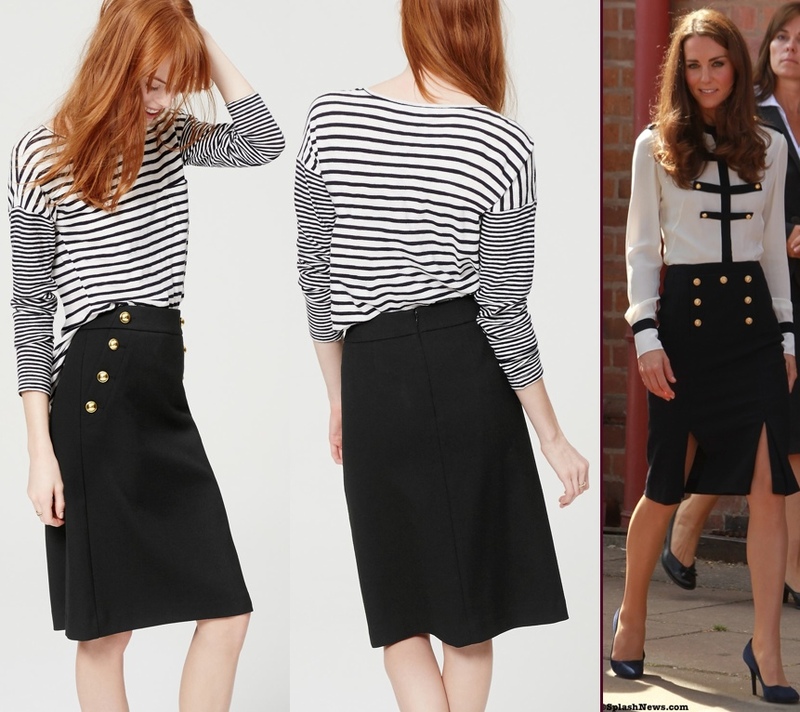 FEB 29: For the Alexander McQueen military style (or sailor style) skirt this is the Ann Taylor Loft Sailor Pencil skirt, $69.50. Our thanks to Rachel F on the WKW Facebook page for the tip on this one! FEB 28: For the Monreal London Tuxedo Track Pant ($345) this is the Tuxedo Long Legging, $119 at Beyond Yoga. Kate’s style is looser, not a legging, but this is similar. Many thanks to Janet Evelyn on the Facebook page for the tip!